Next Thursday marks the beginning of the National Football League’s annual draft. Over the course of three days, 253 of college football’s finest athletes will be told to pack their bags and move to a new city, be it Jacksonville, New York or Green Bay. The first evening is a spectacle not all that different from an Oscars ceremony (that is, if the Oscars allowed attendees to raucously boo award presenters.) Wardrobes are critiqued, major networks offer wall-to-wall coverage and tearful hugs are exchanged. For the players selected, all too many of whom grew up in economic despair, being selected is a promise of financial security. Overnight, 32 young men go from ramen-slurping college students to millionaires. As the draft rolls on, the mystique dies down, the so-called “generational” prospects already taken. Yet many of the NFL’s most impactful players had to wait awhile to hear their names called. A select group of Tech players — quarterback Justin Thomas, center Freddie Burden, defensive linemen Patrick Gamble and Francis Kallon, kicker Harrison Butker, and punter Ryan Rodwell — are hoping for just that. While Tech football does not have nearly the professional degree of programs such as Ohio State and Alabama, which see a number of players drafted in high spots each year, its successes at the next level have been notable. Former first-round pick Calvin Johnson was amongst the best receivers in the league prior to his surprising retirement. Safety Morgan Burnett was a third-round pick who has morphed into one of the better starting safeties in the league with the Green Bay Packers. Defensive lineman Adam Gotsis, widely projected as a mid-round pick, shocked many when the Denver Broncos took him as a second-round choice last season. The draft process begins in earnest shortly after the season ends. Players declare for the draft (thus forgoing whatever remaining NCAA eligibility they may have), sign with a professional agent and compete in various pre-draft events. These range from workouts held by interested teams to full “bowl” games that pit artificially assembled teams of college prospects against one another. One Tech player — Butker — was even lucky enough to be invited to the NFL Combine. The Combine is one of the most closely-followed scouting events in the process. Prospects complete athletic drills such as the 40-yard dash and weightlifting. Perhaps more importantly in the eyes of some teams, though, they are subject to rigorous character interviews. After all, a team makes an investment in a player when it chooses him; protecting that investment is the wise thing to do. Each of Tech’s players is viewed differently by the scouting community. One of the more highly-touted prospects is Gamble, who was graded by draft expert Lance Zierlein as a late-round talent who could develop into an effective rotational player. “While he needs to add more bulk, he has the length and athleticism that 3-4 teams will want to work with at the defensive end spot,” Zierlein said, courtesy of NFL.com. Zierlein, however, noted that Gamble had a tendency to be dominated by double teams and needed to put on weight in order to compete with bulkier players in the NFL. A team drafting Gamble, thus, should not expect immediate contributions, save for his play on special teams units. While Gamble will need to change his style of play, Tech quarterback Justin Thomas will need to change his position altogether. The Prattville, Alabama native was once recruited by Alabama coach Nick Saban to play defensive back for the Crimson Tide. Choosing to stick it out as a passer, Thomas chose the Jackets instead. But in order for him to carve out a career at the professional level, he will have to move to either cornerback or safety. Thomas has an unteachable attribute that scouts will surely covet: his speed. At Tech’s pro day, a Combine equivalent, Thomas ran a 40-yard dash timed at about 4.30 seconds, a mark that would have put him among the ten fastest players at the Combine. Thomas is even more a project than Gamble, though; he has never played a defensive snap at the collegiate level, and playing against receivers making millions of dollars is hardly a way to soften the learning curve. The rest of Tech’s prospects have not garnered much attention. Davis, for example, was a productive linebacker at the collegiate level who will have to overcome physical limitations at the next level. 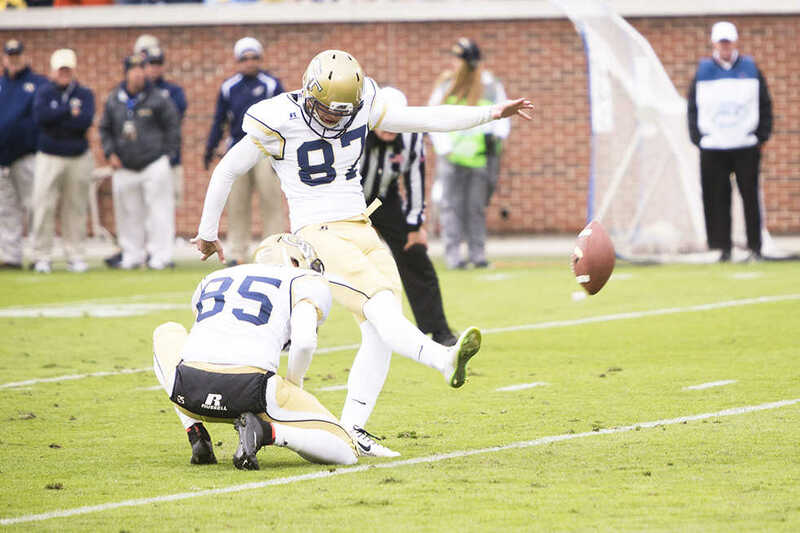 But the path of Butker, the senior who famously drilled a game-tying field goal versus UGA in 2014, is a reminder of just how complex the process can be. Butker’s agent, Jordan Hagedorn of BTI Sports, says that the connection was made via a “friend of a friend.” A fellow agent mentioned that Butker was looking for representation. Hagedorn, not far removed from passing the NFL Players Association’s agent exam, was looking for his first client. One of those needs will certainly be support as the draft process nears. Hagedorn has been in contact with NFL teams. Eight, he says, have expressed varying degrees of interest in his client. The reality of being a kicker, however, is that being drafted is not likely. Arizona State’s Zane Gonzalez may be the only one whose name is called next week. But Hagedorn acknowledges that there are advantages to being undrafted. Players not selected by a team are free to negotiate with any or all of them. With enough interest, Butker could very well pick his destination. “We’re very open-minded and open-hearted,” said Hagedorn. “We’re just going to let it play out.” For the kicker who meticulously (and famously) recorded every kick of his collegiate career in an Excel process, sitting back may not be easy. Nor will it be for any of Tech’s other draft prospects. But with a week until the draft, workouts completed and interviews aced, waiting is all that remains between Tech’s graduating football players and their hopes of playing the sport in the finest league of its kind.